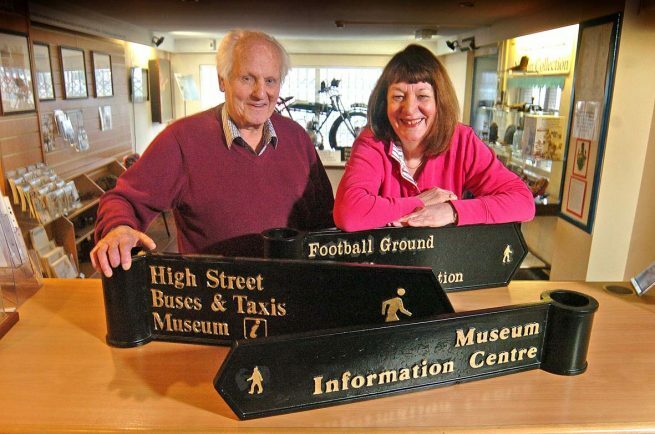 FOUR directional signs which were taken down from Bromsgrove after the museum closed have been restored to their former glory and will soon take pride of place in the town centre. Dennis Norton, member of the Norton Collection Museum Trust, with the help from Bromsgrove District Councillor Rita Dent and council officer Kevin Hirons, tracked down the signs to the authority’s depot. Then in a shed in the depot, Dennis has spent two weeks painstakingly repainting the 270 letters on them. One of the places listed on the signs is an ‘information centre’ which the town does not longer have. Dennis is now looking into opening one in the museum.